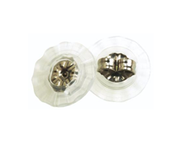 This set of three medical plastic earrings includes a decorative box. The set contains one pair each of the 6mm Rose ( New! ), 6mm Violet Flower, and the 5mm Aquamarine Butterfly All are set in our super safe medical plastic. Backs are always included. The three styles are shown below. Separately these would sell for $90, making the Gift Set a great value at just $72! While supplies last. No substitutions please. I got these for my granddaughter who just got her ears pierced. They will be gifts so she will be thrilled. The earrings are pretty and packaged nicely. I like that they are plastic in case of any sensitivity to metals. I appreciate the great deal. I got this gift set for my daughter, 6 months old, since I didn't want to chance her ears getting infected the first year we have her ears pierced. They are pretty and have yet to infect her!